Help us make the STEM Fair a huge success! 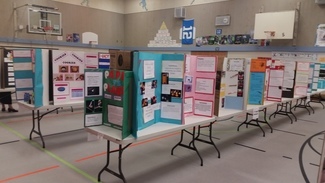 Help the kids get their boards set-up in the gym on the morning of the STEM Fair and award stickers to students who choose to participate in a short Question & Answer session about their projects. Help us set up & clean up the STEM Fair. You can even volunteer to run a demonstration table!